Things have been really busy over here lately. You guys have been ordering like crazy, thank you for that! I have some new things in the works that I’m not quite ready to announce just yet, but they are coming. I’m also trying to squeeze in editing a video, which I hope to have ready soon as well. Since people have been asking for it, the store now has an insured and (to some countries) trackable shipping option. The standard non-insured option is still available. A list of the trackable countries and more info on the different shipping options is available here. Hobbyking seems to have trouble stocking the TGY-210DHM and the high quality BMS-210DHM is nearly impossible to find online for some reason. So to make things a bit easier I for people to get this excellent servo, I decided to buy a small batch of 100 units. Check it out in the store here. ← Tricopters back in stock! 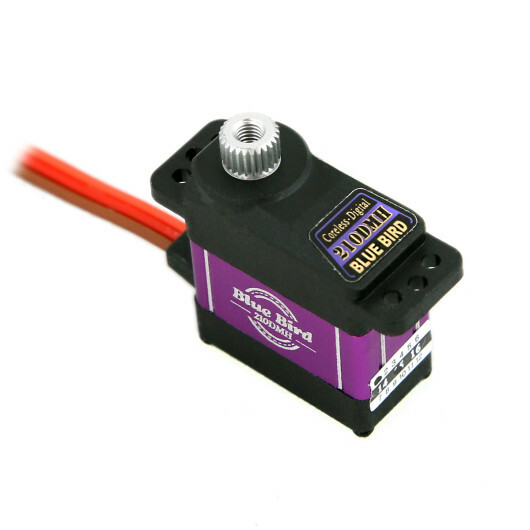 Awesome, I have a Blue Bird on my V3 and it’s an awesome servo. Also, I’m glad you’re making a video. 4 years ago, your videos inspired me to get into the FPV hobby. When a mini comes out I will buy another kit for sure. Hopefully you soon have some time to spend on the Naze32. Yeah I already watched that. It’s a good video but most of it I already figured out myself. Spend some time tuning the PID values last week but I just can’t get the jaw anywhere close to normal, and the weather hasn’t been helping either. Good move, David! Thanks! Spent quite some time to find a source and finally discovered one store in Germany offering the BMS-390 (which now eagerly waits to become part of a V3). Thank you to be not like the other like “Buy my stuff and that it”. I think your customer service are the best and everybody should take a lesson from you. Hey David do you know about how long it will be until the tricopter kits are back in stock? I’ve been flying a Turnigy Talon but I like how yours is designed more. The tricopters are in stock now! Glad to hear you like my design! Is the output shaft able to fir the tricopter mount? Same size? I bought a servo from Hobbyking in hopes to upgrade but the output shaft not he servo is much too small. Darn it. I need to spend some time in sketchup and see if I can modify the drawing to use this servo. wow wow!! David is amazing !! I order some parts feb 17 2015 and received it to my door the 19 !!! very fast shipping!! and also very fast reply from my question!! thanks and sure i will do more business with you soon ! !